This part two of the review of the meeting by utah midwives that occurred in response to a preventable death caused by a serially negligent midwife (Valerie El Halta). Part one can be found here. Keep in mind that these women are all keenly aware that these remarks are being recorded, so they believe that their reaction to a preventable death in their profession is normal and acceptable. Summaries of the meeting content are in bold, my commentary is in normal text. A woman discusses the need for legal assistance for midwives. Another woman said that UMO needs a legislative agenda. A student midwife named Catherine discusses possible legislation in California to make it easier for direct entry midwives to order labs, use medications, and attend births without any medical oversight. She shares how other midwives can help the effort to make life easier for direct entry midwives. Catherine wants to remove physician/nurse supervision of midwives and carrying of medications and oxygen. She notes that the problem is that physicians put their own malpractice insurance at risk by supervising these sorts of births and birth centers. Insurance companies are not caring corporations, they don’t take on policies or reject them on the basis of politics. They crunch numbers, do the math, and conclude if covering a practitioner it is an acceptable risk to insure. They have declined to insure these birth attendants, even with physician supervision. That should be a red flag for anyone paying attention. Midwives act as though there is a vast conspiracy instead of the simple fact that out of hospital birth increases the rate of perinatal death and injury, and this is especially true when non-nurse midwives are the attendant. Around 37 minutes a midwife named Dyanna Gordon says “One of the big problems is that, we are on our way to mandatory licensure.You know, we haven’t played nice with each other for years.And if we don’t do something quickly, we are not going to have many options left available to us. We left things how they were, you know, and I believe that there are very few midwives in Utah who believe in mandatory licensure. I think most of us are very happy, with where things are, with licensure being optional. But that’s not where we are going to be in a year or two, if things don’t change. DOPL stands for the Department of Professional Licensing. Diana Gordon understand the problem- there is no real oversight of unlicensed midwives, they can do whatever they want. It is obvious that a midwife could seriously injure or even kill someone by practicing dangerously. Diana is right that it is ‘affecting everybody’, but not in the way she means. She means it is affecting other midwives. I mean that it is affecting the parents who had to bury their child, other community members who were supporting them through that time, the investigator who had to go through the details of it, reporters, and everyone else who heard of the story and felt heart broken. How do I know Diana has no consideration for the community or the dead baby? Her solutions are all about keeping the situation the way it is instead of changing it to prevent the next tragedy. There is discussion about how to organize, logistics, etc. The details are boring and I am continually astounded at the lack of technical knowledge that the midwives display during the meeting, such as the constant echoing and the lack of editing for the first 6 minutes of murmurs. I was also surprised by their inability to actually make any progress in making a decision. They take two hours to decide if to have a meeting and when and what to call themselves. Yeesh. Tara Tulley talks about legal fears because a member of the old organization’s computer was seized during a search warrant (Vickie Sorensen). The professional organization’s computer was seized by police during a raid of some sort. Needless to say, this is not a problem that real medicial professionals are likely to have. The Utah Medical Association certainly doesn’t have this problem. I cannot find any information on what happened to this computer, or why it was taken, except on the laughable “our sisters in chains” website, which claims it was all persecution (as you will note, basically ever midwife arrest is unfair in the owner of OSIC’s opinion). They want to raise money for criminally negligent midwives, which I have learned is the norm in this line of work. Comparing their story of what Jessica Weed of New Mexico did and the actual news accounts makes this website completely unreliable in my mind (scroll down to New Mexico or control+f for Jessica Weed). Who knows what Vickie Sorensen was accused of or why her computer was seized? If anyone finds any information about this raid please let me know in the comments. Tara Tulley asks Suzanne Smith if there are legal concerns with continuing with the new organization. She says that she would rather move onto a new organization because there is no real hope of getting the seized computer back so they have to start again from scratch. She doesn’t feel that the activity of any member does not taint the organization so it would be okay to be the utah midwives association. Well, we were all aware that Suzanne Smith was okay with shady behavior from other midwives, due to her previous actions (ignoring complaints of forced vaginal exams and inappropriate sexual touching at her clinic, and subsequently recommending that same midwife to new patients), but now we have her saying it out loud. She doesn’t care if a midwife is under investigation for a death or anything else, it just matters that they are there to protect their collective income stream. Why are they sorry to valerie? Why aren’t they sorry to the parents who had to bury their child? Direct entry midwives consistently display a depraved indifference to the well being of babies and mothers. The status quo allowed a clearly dangerous woman with a pattern of negligence to legally practice midwifery in the state of Utah. The status quo allowed a baby to die for no real reason. How is no one at the meeting able to see how horrible this looks to normal people, who generally have a reaction of total devastation when they think they could have contributed to the death of another human being? These women directly contribute to whoever ends up dying or being damaged next, and they could not care less about it. People can “believe” whatever they want to about birth, it does not merit an endorsement by the state by letting those practices continue legally. It is also worth noting that this framing of midwifery practice from the meeting, where being a midwife is about practicing in whatever way you believe to be best… is very different than the way they presented midwifery to legislators when they originally passed the direct entry midwifery act. Previously, utah midwives made it seem that there was one responsible way to practice midwifery, the way where you only accept low risk women and transport at the first sign of trouble. They claimed it was an evidence based and safe practice. I doubt that law makers care at all about what midwives believe to be true about safety (especially when they believe clearly dangerous things, which I will demonstrate in a later post), they want facts. Midwives OWE the public evidence based practices because they have the potential to be a public health menace. Suzanne smith says- what im sensing, from the way the conversation has gone, is that everyone is very concerned about how the Valerie situation, and possibly to some extent, the Vickie Sorensen situation, may affect us all legally. So it seems to me like the big motivating factor for everyone to suddenly be interested now, is the possibility of incoming legislation. I think that’s very reasonable (chuckles), I think that’s a very real possibility, that we will face hostile legislation as a result of this, and I just want to give a little reality check to the meeting. She notes that they may have as little as 90 days to formulate a response because of legislative session deadlines. Again, absolutely no concern about what to do to prevent the next death, just information on how to tell politicians that the legal situation of midwives is totally acceptable even though it quite literally cost a child their life. That’s because it isn’t right. The proof is in the tiny grave that none of these women bothered to think about when they realized they might make less money if the public got wise to what midwifery is really about. Tara Tulley interjects to discuss how Oregon is currently fighting against legislation to make licensing voluntary, and that at the time of the recording Oregon and Utah were the only two voluntary licensing states. She notes that if midwives there lose voluntary licensure (which they ultimately did) then it puts Utah midwives in a position that is difficult to defend. Of course Tara doesn’t mention WHY Oregon was changing its laws- it is because of a string of deaths caused by negligence, just like the one in Utah (and the future deaths that will no doubt occur if nothing changes). The bottom line is that this type of legislation has been tested in Oregon. It was tried, and it failed spectacularly. Do Utahans want to wait for more deaths before taking action? What possible reason is there that things would turn out differently here? Tara tulley- “I don’t know if Holly Richardson can join the committee, but I know that she will be involved and will help us. Tara notes that Holly has been consulting with her about this issue already. Republican Holly Richardson, who was instrumental in getting the original direct entry midwifery act passed in Utah, is consulting with the midwives about what to do about their bad PR, now that the logical conclusion of the state’s policy has become apparent. She unfortunately couldn’t attend the meeting, so she was unable to demonstrate her cold indifference to the grieving family along with the other Utah midwives in attendance. Without warning, she “stripped the membranes” — a procedure to separate the amniotic sac from the wall of the uterus and stimulate labor, Rose said. El Halta arrived at the mother’s home Aug. 17 and inserted a vaginal pill that she said she received from her son, a pharmacist. El Halta had “boasted … that she used real ‘medicine,’ not herbal medicine.” Investigators later concluded the pill was Cytotec, a drug used to induce labor despite warnings that it can cause uterine rupture and other complications. The mother received three more doses. THIS is the woman that these midwives are defending. All the talk about patient autonomy, about low risk women, about safe practices, it all disappears when they get in a room together and decide that their sisterhood is more important than…anything else really. Its even more important than other people’s lives and safety. A baby dying isn’t “a bit of a scare” to the parents, or anyone who isn’t a total sociopath. You can there hear many midwives laughing. Laughing. About this. The death happened on August 17th. This meeting took place a little more than 4 weeks later. Its worth noting that another prominent member of the community, Kristi Ridd Young, was also in attendance, but felt the need to say nothing. I find it deplorable that no one mentioned the baby or the family at ALL during the meeting. No one discussed what they could do to help that family or help prevent the next tragedy. The entire meeting was about protecting their own cause instead of what their cause had cost a family. 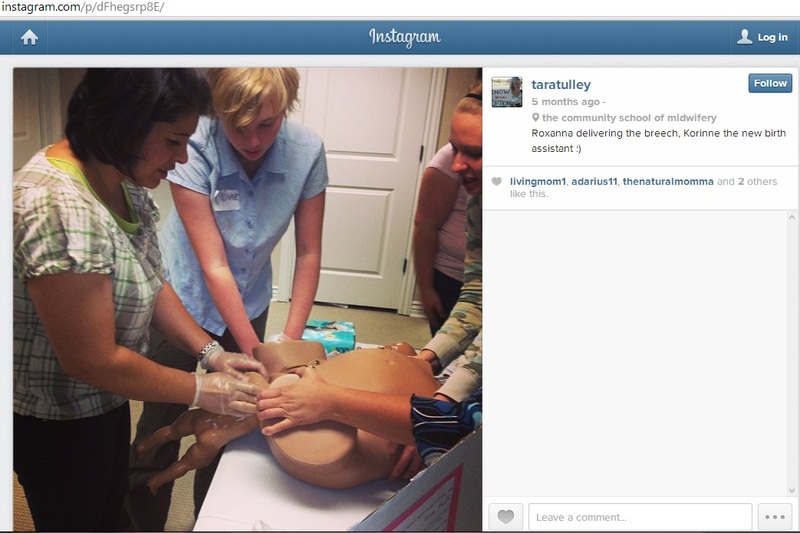 why are Utah midwives learning breech births? found this photo awhile back, but didn’t have time to write about it until now. This is from the community school of midwifery. Direct entry midwives should not be attending these births, ever. Oregon learned the hard way that direct entry midwives aren’t equipped to deal with breeches. They have recently changed their legislation to reflect the problems caused by direct entry midwives in out of hospital birth. The problems I see with having a state with two levels of direct-entry midwives are that midwives are less united. When there is a proposed change to the rules or statute both licensed and unlicensed midwives are more willing to compromise. There is an out. We saw this a few years ago when we compromised to not let licensed midwives to any twins, breeches, or deliveries before 36 weeks. The licensed midwives felt like they were safer to compromise, and then decided it was a mistake. The unlicensed midwives stayed unlicensed because they could maintain their rights in those situations. So now we have a larger problem. There are very qualified midwives to are licensed, who know by many years of experience and education how to appropriately screen when these women present, how to monitor, and when to transfer out of care who are not able to attend them. According to her, the problem isn’t the danger inherent in taking on high risk cases, its that midwives are less united. The problem isn’t that patients are getting false information about the safety of out of hospital birth for breeches and twins, its that a dangerous midwife might not feel comfortable calling another midwife for help (instead of EMS). 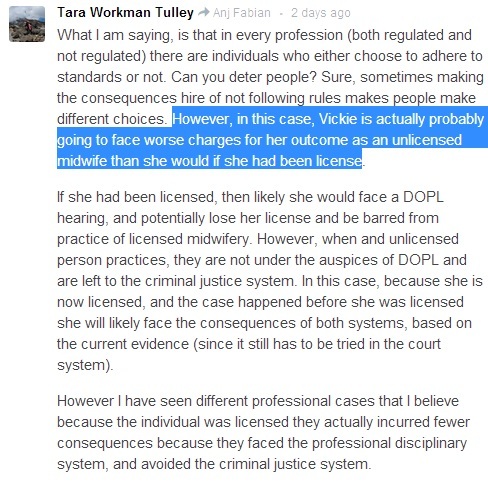 One thing that I agree with Tara Tulley about is that unlicensed midwives cannot access the drugs that licensed midwives can, but they are the only ones who can take these high risk cases legally. This situation makes zero sense. Of course she believes the answer is probably less accountability, while I think licensing should be absolutely mandatory, with harsh consequences for people who break the law. Its no wonder she feels comfortable teaching breeches at her school. 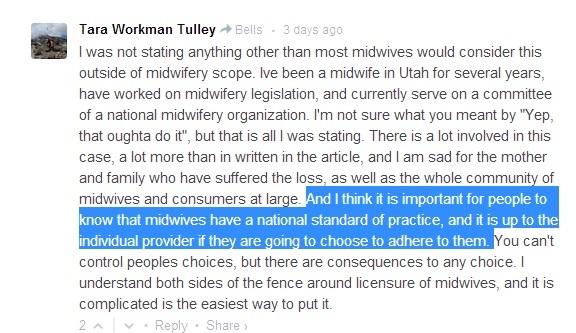 After all, Tara Tulley started practicing when midwifery was illegal in Utah, so she has no problem circumventing the law to serve her natural child birth ideology. Yes, there are some scary ways of practicing. But I know if I have a relationship of trust with someone I am both more willing to go to them for help, and to also accept and consider feedback. I believe I am a good midwife, but my seasoning was not innate! I had to learn out to communicate. I had to learn that scaring my clients with the interventions of hospitals was not helpful when they became necessary. She calls this solution “responsible inclusion”, as if there is anything responsible about accepting people who practice outside their actually competency as a midwife. Having another midwife to call isn’t worth anything in countless dangerous situations. Tara Tulley isn’t an anomaly, she mirrors the position of MANA, the professional organization for midwives in north america. They have declined to define a ‘low risk’ birth as well, feeling more comfortable to leave it up to individual midwives to decide. Regardless of how another midwife practices, or what her training is, if she is unlicensed then she does have the right to practice, and the parents have the right to choose her. If it is legal, then ostracising her will not make it illegal for her to practice, and she may decide that asking for help is too risky. She may be angry, and may not know how to forge relationships in hospitals. Perhaps, part of the reason the obstetrician was angry when you came in with your responsible well-charted transport. Perhaps he had just taken the client of a newer midwife, who transported, but did not know how to communicate in a way that was effective. Perhaps she offended him because she didn’t know how to see things objectively, not react to emotions, and validate and support him in order to foster a working relationship. If a midwife decides that asking for help when a patient needs it is too risky for the midwife, and doesn’t call because of that, she has extremely poor judgment and should not be a midwife. Safety should overcome pride without any hesitation. She lists several scenarios where midwives, who are tasked with delivering a baby and ensuring the safety and health of the child and mother, lack basic skills needed to perform their job adequately. The obvious answer to that problem is to change the law so that there are serious penalties for being a threat to public health and safety by endangering the lives of women and infants. Its deplorable. Midwives have always resisted common sense laws to protect consumers because they don’t want to be held accountable for their behavior. The hardest lesson I had to learn about natural child birth is this: midwives don’t care about you. They don’t. They sell their services on acting as though they care, but when they are talking among themselves, or dealing with a death caused by someone in their community, their true colors come out. They couldn’t care less. Death is natural so its okay to them. That is the only way I can explain the blase and self-centered attitude of the midwifery community when it comes to safety of mothers and infants.